The affected schools include Dynamic Secondary School, Bukerere College School - both located in Goma Division and Makerere Advanced School in Nama Sub-county (file photo). 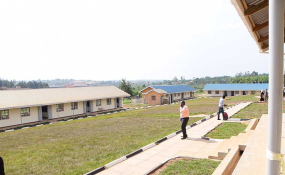 Mukono — Government has halted funding to three secondary schools in Mukono District for allegedly inflating student enrolment figures, Daily Monitor has established. The affected schools include Dynamic Secondary School, Bukerere College School - both located in Goma Division and Makerere Advanced School in Nama Sub-county. The schools are among the 34 others partnering with government to implement Universal Secondary Education (USE). A survey carried out in the three schools by district officials last year revealed that more than 1,000 non-existent students appear in the Ministry of Education data base. The survey showed that Makerere Advanced SS had only 24 students under USE, but it was purported to have 398 students in the ministry data base while Dynamic SS and Bukerere College, which have a population of 589 and 126 students respectively, inflated the number to 1,305 and 233 students. By November last year, government had reportedly lost Shs875m to the ghost students. "We are happy that government has intervened and blocked funding to the thieving schools when we raised the complaint," Mr Emmanuel Mbonye, the district speaker, said on Tuesday. Every student under USE in a private school is allocated Shs47,000 per term, while those in public USE schools receive Shs41,000 each. Mr Richard Muhumuza, the director Dynamic SS, said he is aware of government's action, but denied having ghost students. "[When] the district officials conducted a head count, unfortunately it was a public holiday and only students in the boarding section were present yet day scholars are the majority. So, they captured wrong information about our enrolment," Mr Muhumuza said. "Deciding to partner with government was a deliberate choice to support the scheme and we were not after money," he added. Mr Muhumuza also said by the time the ministry conducted a head count, the school population stood at 1,700, but it has since dropped to 1,600 students. Mr Muhumuza said the ministry breached a contract it signed with them when it blocked the funding. "I am going to drag them to court if this term ends before they have remitted that money," he said. "My staff are not doing work as expected because they are demoralised. I have even sold my car to cater for key expenses that could have been settled if the money had been wired to the school account," Mr Muhumuza added without revealing how much money the institution has been receiving. He blamed his woes on some district officials whom he said are bent on failing the school. Mr Jonathan Mukholi, the Bukerere College head teacher, said they were making efforts to engage ministry officials. "Accounting issues are handled by the director and he is doing his best to address them," Mr Mukholi said. When contacted, the Ministry of Education Permanent Secretary, Mr Alex Kakooza, said he could not speak about the matter as he was attending a meeting. "I cannot talk now, call me later in the day," he said before hanging up. Mr Derrick Namisi, another ministry official, said government will resume funding to the schools after getting proper accountabilities. "The Inspector General of Government is currently investigating that matter and those schools cannot get money now until they are cleared," he said by telephone yesterday. Currently, government spends more than Shs50 billion on capitation grants for USE students annually. USE was introduced in 2007, a decade after Universal Primary Education (PLE) was rolled out to enable eligible primary school graduates enrol in tuition-free secondary and vocational training institutions.